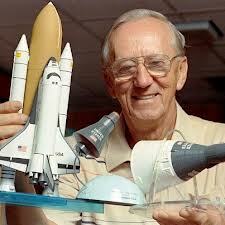 Guenter Wendt was a German-American engineer noted for his work in the U.S. manned spaceflight program. 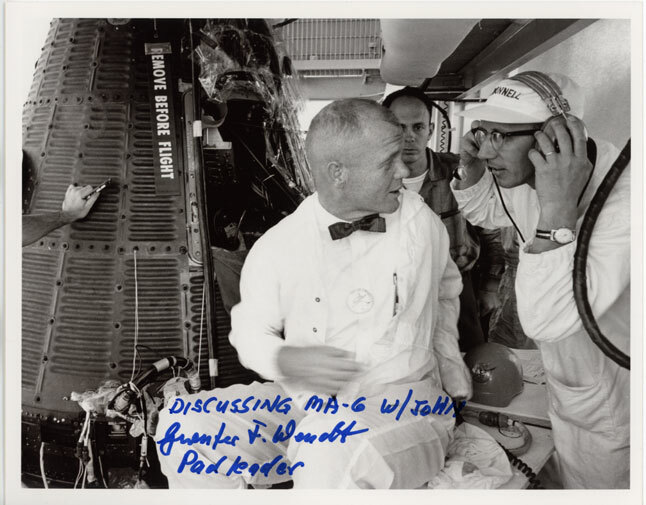 An employee of McDonnell Aircraft and later North American Aviation, he was in charge of the spacecraft close-out crews at the launch pads for the entire Mercury and Gemini programs (1961–1966), and the manned phase of the Apollo program (1968–1975) at the Kennedy Space Center (KSC). His official title was Pad Leader. 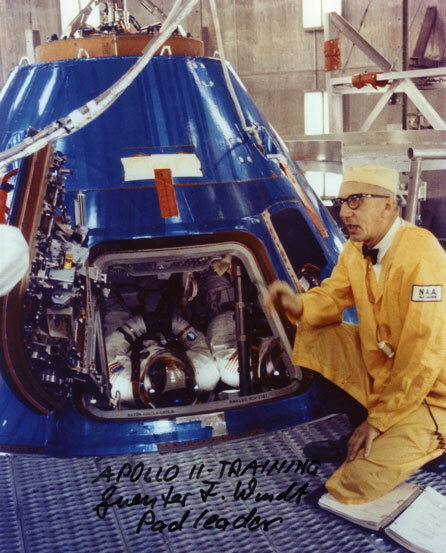 In NASA documentary films, Wendt appears as the bespectacled, thin man in a bow-tie and white cap and coat, usually standing near the hatch, clipboard in hand; or bending over seated crew members, pulling their safety harnesses snug for launch. 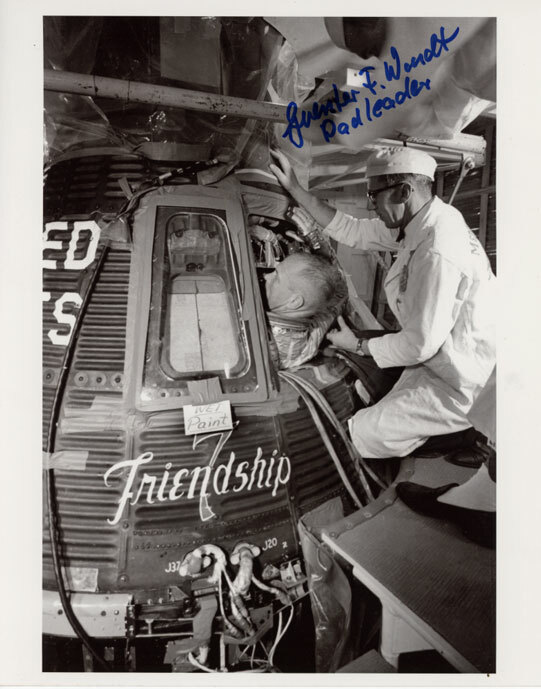 I was honored to have known him and proud to be able to offer the following autographed photos of "The Padleader", authentically handsigned specifically for Farthest Reaches. 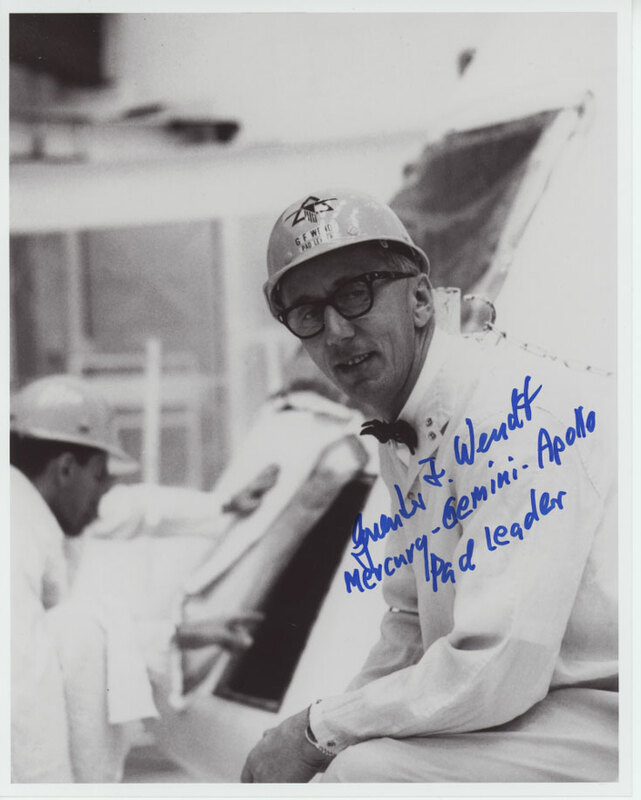 This portrait of The Padleader is hand signed and inscribed by Guenter himself who adds, "Mercury, Gemini and Apollo". He was a "one of a kind", that's for sure. The best at what he did, demanding to work for and not one to triffle with BUT when he let loose his sense of humor, was second only to Wally Schirra and THAT's sayin somethin....Only a few left. 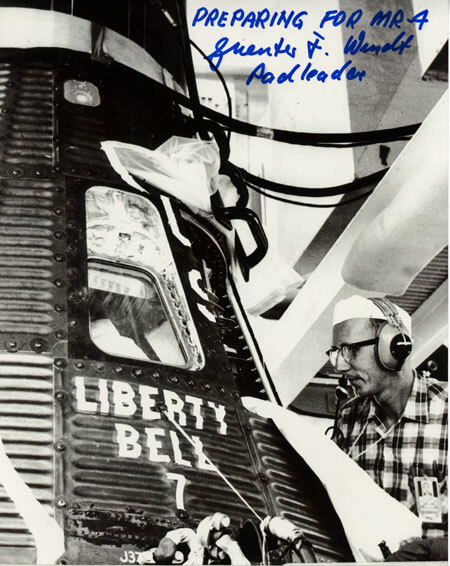 Guenter Wendt is seen prepping Gus Grissom's ill fated Liberty Bell 7 (MA-4). He would be the last person to see it close up just before lift off and one of the first to see it again after being found on the sea floor almost 27 years later. Hand signed and inscribed by Guenter. Measures 8" x 10'. 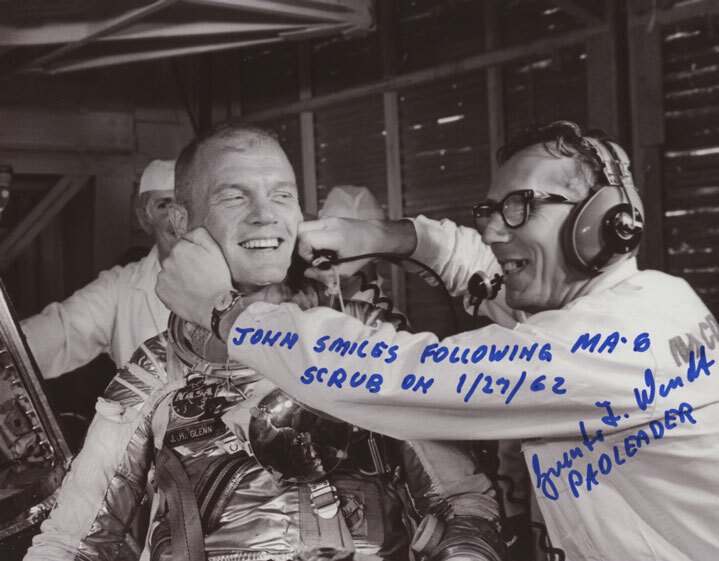 Guenter being playful with John Glenn following MA-6 scrub. Only Guenter or Annie Glenn could have pulled this one off. That was a frustrating day to be sure but Guenter was determined to make the best of it as they all needed to let off some steam. A classic image. Measures 10" x 8". Conferring w/ John Glenn in the White Room. For some reason, the "Clean Marine" decides to wear his bow tie. Hand signed and nicely inscribed by the Padleader. Measures 10" x 8". Awesome image Guenter and the first Astronaut to fly orbital. 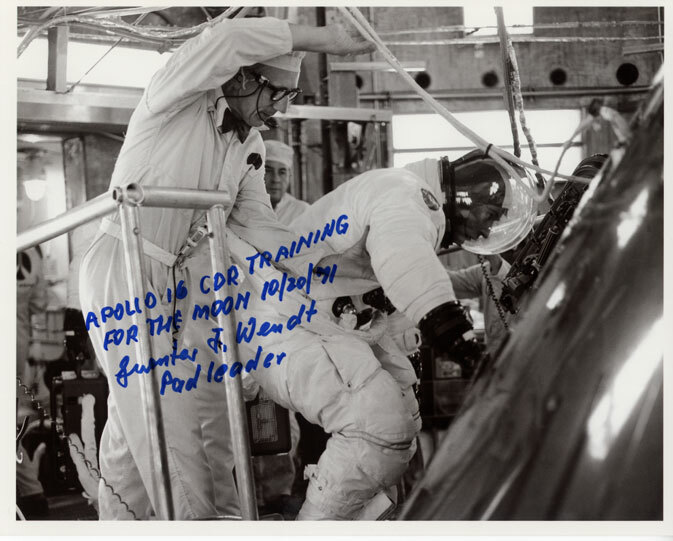 John Glenn loading during MA-6 training. The richness, texture, detail and technology in this image is amazing. There were simply no inscriptions Guenter could think of to make it any more special so he just signed it and added "Padleader". Fact is, I considered this such a great scene, I didn't want to loose a smidgen to cropping so produced it full frame for the most impact. I'd say it worked. One of my favorites. Measures 8" x 10". 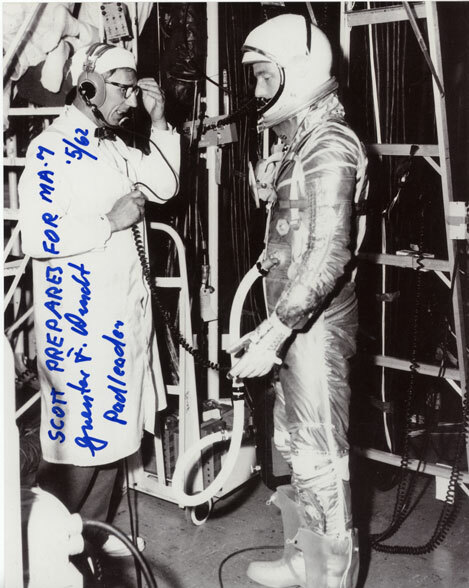 Scott Carpenter looks serious in spacesuit as he listens intently to what Guenter has to say just prior to his MA-7 flight in May,1962. Hand signed and inscribed accordingly by Guenter Wendt. Measures 8" x 10". Signed in just the perfect place in great contrast to the photo. 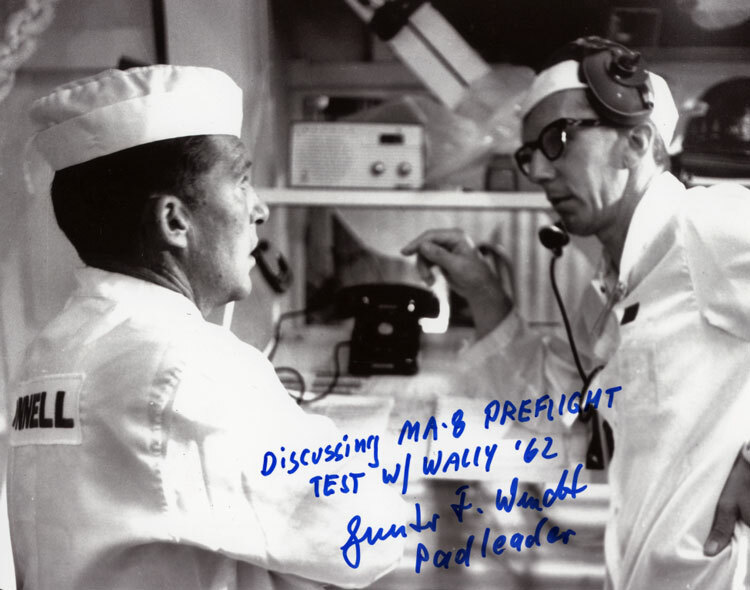 Early image of Guenter Wendt with Wally Schirra having an MA-8 preflight meeting with a fitting inscription. Measures 10" x 8". 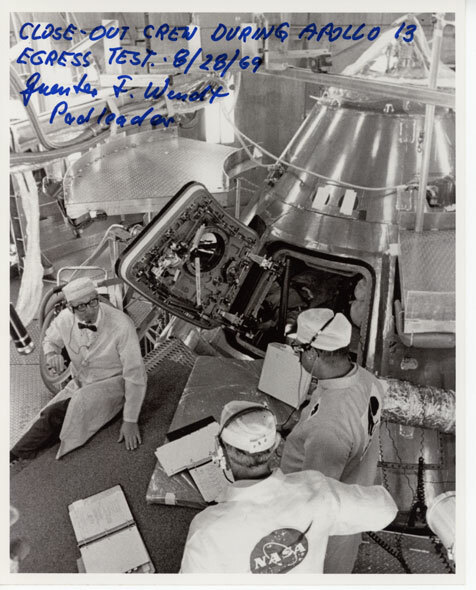 Wally Schirra and the Padleader in the White Room on the occasion of Wally's GT-6 scrub on December 12, 1965. Awesome pic of Wally smiling through his helmet. Hand signed by Guenter Wendt and beautifully inscribed as you can clearly see. Measures 8" x 10". Apollo 11 Countdown Demontration Test (CDDT) on June 26, 1969, a mere 20 days before this crew would be launched to the moon. 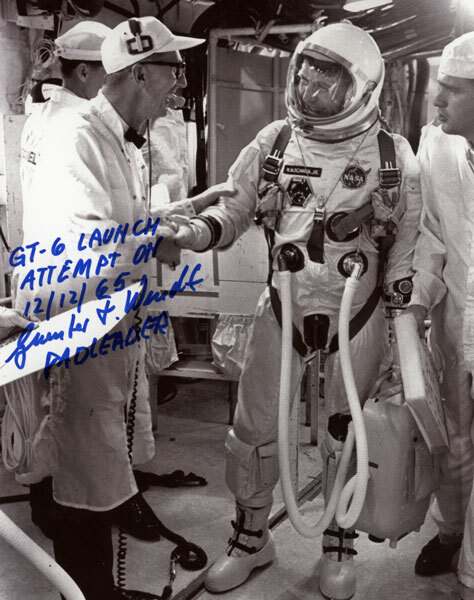 Guenter can be seen at the hatch of the Command Module with the crew already inside. Hand signed and inscribed accordingly by the Padleader himself. Measures 10" x 8". Apollo 11 training with the flight crew visible just inside capsule. Beautiful image of Guenter presiding over the crew in his domain. 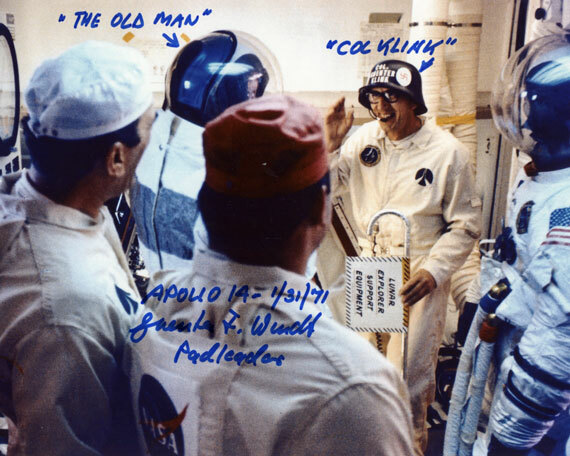 Hand signed by Guenter Wendt who inscribes, "Apollo 11 training....Guenter F. Wendt, Padleader". Only a few left. 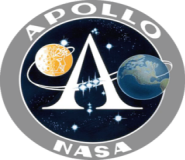 "Apollo 13 - A very close call !" No words could have said it better. Image shot as the crew was being loaded for launch. Awesome inscription hand signed by Guenter Wendt. Measures 10" x 8". This image shows the crew just inside their capsule during close out as the Apollo 13 Egress Test begins on 8/28/69. Guenter provides a fairly lengthy inscription in blue sharpie. Excellent photo with great detail of inner surface of hatch. A lesser seen image. Measures 8" x 10". One of Guenter's very well documented infamous Gotchas ! This one played on the Apollo 14 crew. A classic moment with a wonderful inscription by Guenter. Measures 10" x 8". 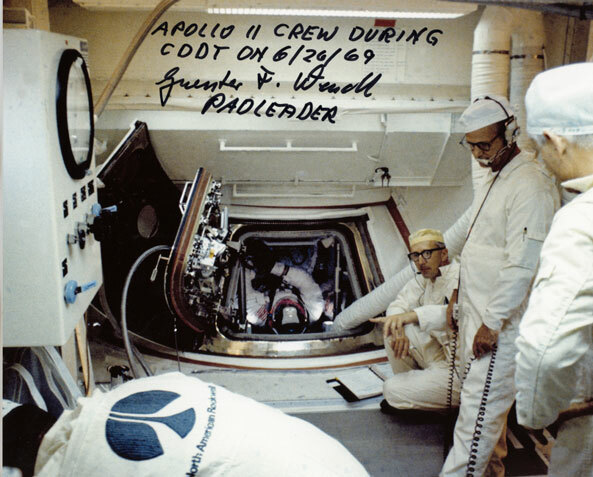 Guenter assisting John Young as that day's Altitude Chamber Test is set to begin for the Apollo 16 flight crew. This test took place on Oct. 20, 1071 and Guenter signs and inscribes accordingly. Very nice image. Measures 10" x 8". 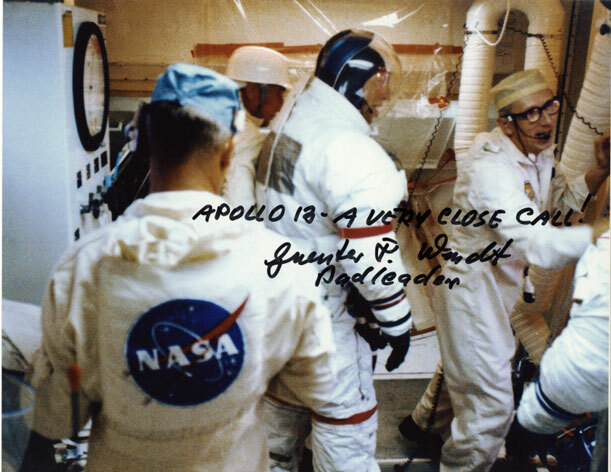 Guenter assisting Charlie Duke on Oct. 20, 1971 as the Apollo 16 crew begins the Altitude Chamber Test. 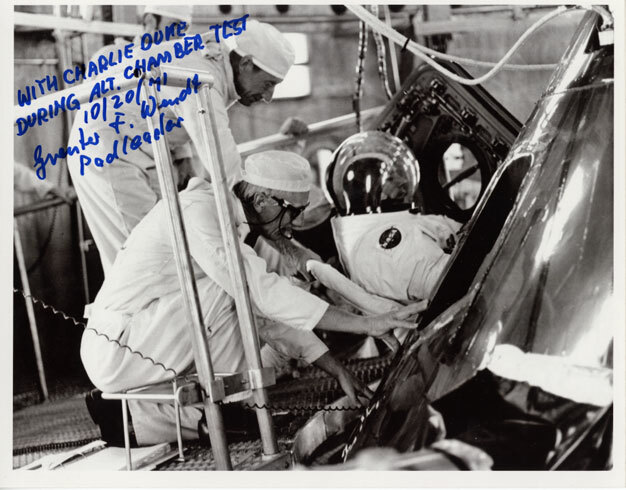 Hand signed by Guenter who inscribes, "With Charlie Duke during Alt. Chamber Test, 10/20/71....Guenter F. Wendt, Padleader". Measures 10" x 8".